384 pages | 43 B/W Illus. Understanding the economic implication of creative individuals and firms is at the heart of the new economy and of related fields such as the economics of knowledge, the economics of science and innovation management. This book brings together a panel of theoretical and empirical contributions which address the generation of creative ideas and their transformation into products and services by firms or universities, as well as the interplay of those organizations in networks and markets. The word ‘creativity’ has been used a great deal recently in relation to efforts to recover from the global financial crisis and re-launch economic activity. Little has been added to explain how and why an economic approach of creativity is useful and necessary. It is useful to understand how the most creative people work and think, and how to foster their creative productivity. It is useful to understand how organizations integrate and exploit creative ideas. It is useful to understand how market mechanisms can handle creativity and how policies must be adapted. It is necessary in the light of the recent economic crises that made innovation, invention and creativity the basis of a new industrialization and fuel for a new economic development. 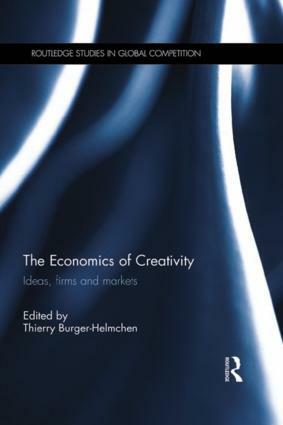 This new book assesses the economic impact of creativity, defining the term and then going on to explore theoretically and practically the economic consequences of creativity through a range of themes including: creativity and evolutionary theories of technological change; creativity and organizational learning; creativity and technological policy; and creativity and economics of networks. This volume offers a rich source of inspiration and ideas for the pursuit of research which merges economic tradition and management perspectives. Thierry Burger-Helmchen is a researcher at BETA Strasbourg and Dean of the Department of Economics and Management at the University of Strasbourg, France.